After studying and trying to get an understanding of the 3-4 Defense, I feel like I finally know how to use the defense. In fact, I am starting to like it more than my beloved 4-3 Defense. Using the 3-4 Defense as a Multiple Front Defense, rather than the 2-Gap base front that I often thought of in the past, can be an effective way to get speed on the field and cause confusion for the offense. Why have I taken to this defense even more than the Miami 4-3 Defense? For one thing, it can be the same defensive look if you want it to be. But it is even more flexible, for a variety of reasons. While one of your “Linebackers” will spend the majority of his time rushing the passer, he still has the ability to drop off and go into coverage. The first element of flexibility comes from setting the front either to the Field or to the Boundary. Some fronts will be Field fronts, and others will be designated with Bench (for Boundary). 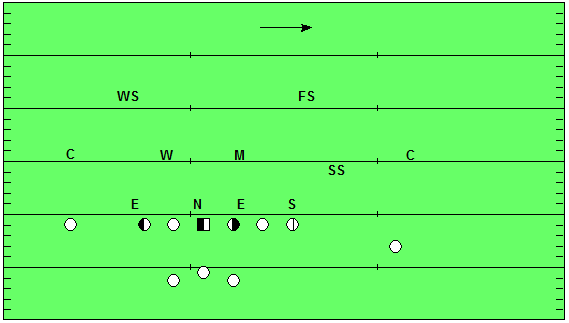 This can be used in play calling the same way we have used Tight and directional designations in the 4-3 Over Front. For simplicity, the Base Front will still be “Over” and the Base Coverage remains as Quarters. The base defense, therefore, is Field Over Quarters. The Field call, and often the Front call, only affects the Defensive Line, Sam, Mike and Will. The Sam will always go to the field. The defense is simplified somewhat for the Mike and Will as they can stay in a 30-Technique most of the time. The Secondary – the Weak Safety, Free Safety and Strong Safety – will align to the passing strength of the formation. Therefore, your Sam and Strong Safety may be on the same side, or your Sam and Weak Safety. In our Field Over front, the alignment is fairly simple. Field tells the Sam Linebacker and Mike Linebacker which side to align to. The Mike may be a backer who is better able to cover ground for you, or your better tackler, since most teams tend to run to the wide side. 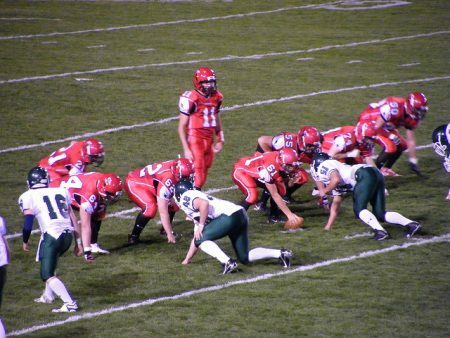 The Will Backer will align in a 30-Technique on the short side of the field. The Mike and Will should be interchangeable, though their skills may mean one player is better to have on the wide side. Whichever direction the Field is, the Defensive Line kicks away from it. It may be helpful to teach your players a base 3-4 Defense with 4-Technique Ends and a 0-Tech nose to drive this point home, whether you intend to use the front or not (if you are going to be multiple, you probably will). On a Field Over call, the Defensive End to the wide side kicks down to a 3-Tech. The Nose moves to a shade on the boundary side, while the End on the short side moves to a 5-Technique. You could play the Sam Backer in a 7-technique inside of the Tight End, because the Head Up 6-Technique is a difficult way to play it. But this player should be a strong, athletic hybrid player who can handle the position if he can handle the teaching.